W.D. & Me On Our First Long Motorcycle Ride 36 Years Ago! 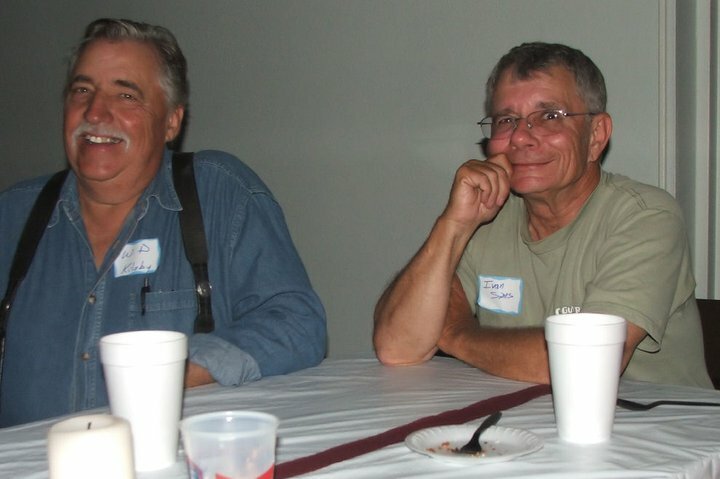 Several weeks ago I met my cousin W. D. (aka Dub) in Lagrange, Texas (of “Chicken Ranch” fame). Dub recently bought a new camper for his retirement travels and was setup at “Colorado Landing” RV park. He and I lived close by growing up and have been like brothers since we were kids. Dub is 18 months older, so like any little brother I wanted to do everything Dub did. Cousins are your first and best friends. We have a long history so we spent the day visiting and talking about old times. My KZ400 that I rode on the trip. Dub and I rode our first long motorcycle ride together. He lived in Eastlake, Colorado just north of Denver, Colorado and I lived in Dallas, Texas. We were young and rode the trip “on a wing and a prayer”. The only thing we planned was the date of travel and our destinations. We met each other in Dumas, Texas which was about midway for each of us. Back then there were no cell phones to communicate with each other as our trip progressed. Dub devised a crazy way for us to communicate on our trip without having expensive long distances charges. When we stopped for gas or to eat etc. we would call Dub’s wife Barb “person to person”. If everything was okay we would ask to speak to ourselves. Barb would reject the call if everything was okay. If either one of us had any problems we would call and ask to speak with Barb. Barb would accept the call and we could tell her what our problem was. This worked very well. As the day progressed we kept checking in and knew the other rider was having a good ride. Fortunately, we did not have any problems that needed to be relayed during the trip. That first day the weather was great… not too hot or too cold. 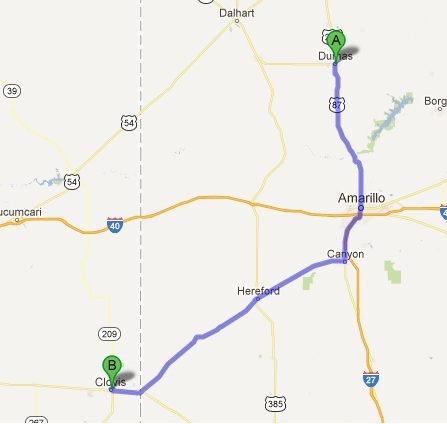 We both made good time and arrived in Dumas about 5 or 10 minutes apart. I was riding a 1974 Kawasaki KZ400 and Dub was riding a 1974 Yamaha 500. Seats on our bikes were not made for staying in the saddle for hours on end. As the hours became longer and longer it seemed as though we were sitting on 2×4’s turned edge ways. When we met up, we both shared similar stories about how hard the seats were. I had passed many riders that day who were standing while riding. It wasn’t long before I understood why they were riding that way. I was soon doing the same. If I remember correctly I could only travel about 100 miles before stopping for gas. It was a welcome break from the saddle. I also had to stop occasionally to oil and make adjustments on the chain. Because of that trip I decided my next bike would not have a chain drive. We were a bit paranoid about parking our bikes outside the motel room, so we pushed them into our room for safekeeping. Nothing like the smell oil and gas as you sleep. 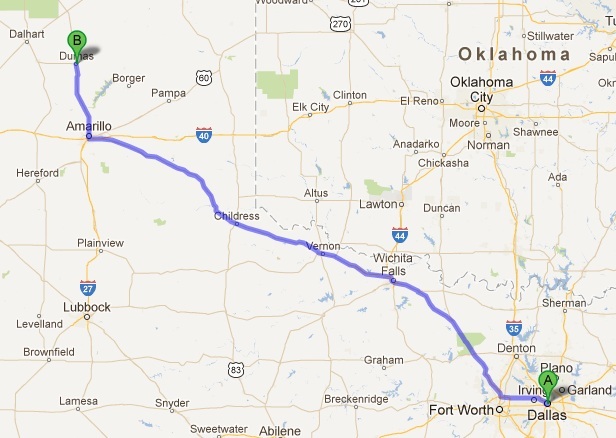 The following day we got an early start and headed to Clovis, New Mexico. Dub’s brother John was stationed at the Air Force base in Clovis. It was a short ride relative to the day before. We stayed with John a couple of nights. John had a bike so we spent the following day riding around Clovis. Dub had a minor mishap the first day. Shortly after starting his ride he broke his windshield and had ridden with half a windshield. We checked with the local Yamaha dealer there in Clovis to get a replacement windshield. They had a windshield that was the same size and shape but the mounting holes did not match. We solved the problem by drilling a couple of holes to make it work. Later on the trip, Dub would find replacing the windshield to be a good decision. After a good visit and rest we rode to Eastlake the next day. 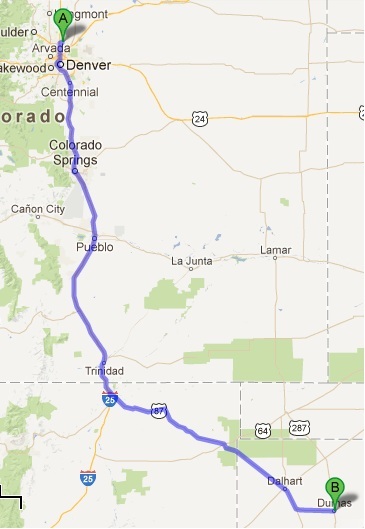 It was a long ride of 511 miles. As we started out that day it began to warm up. We noticed there were hundreds of tarantulas sunning themselves on the road that day. We entertained ourselves by holding our boots just above the pavement and when our boot hit a tarantula; it would go flying down the road. Please remember this was 30 plus years ago and our youth was showing. The weather was great when we started but then turned to light snow and eventually rain. When we started up Raton pass (7834 feet or 2388 meters elevation) the clouds started to roll in. As we reached the top of the pass snow started falling. To add to the situation both of our bikes were carbureted and ran really rough in the higher altitude. I think at one point I may have downshifted to second gear climbing the pass. On the other side of the pass it was all downhill to coin a phrase. A short while later, I thought I had a major engine problem. It was as though I turned off the key. No power… it was a dead engine. I watched as Dub’s tail light became smaller and smaller as he rode farther away. Dub had not realized I was falling behind. I was in a bit of a panic not knowing if he would realize I was not behind him any longer. About a mile down the road Dub turned around and came back to see what the problem was. I had taken my hand off the handlebar to wipe my nose and in the process I inadvertently hit the kill switch. Because of the gloves I was wearing I did not feel my hand hitting the switch. It took a few minutes to realize what had actually happened. What a relief to know there was no problem. After having a good laugh we continued on our way. The snow eventually stopped and we thought we were out of the worst of it but then it started to rain rather heavily. I was wearing a cheap rain suit. It worked well until the pants started to come apart from the knee down. I was getting soaking wet from the knee down. Being wet is one thing… being wet and cold is another… As we were riding through Pueblo Colorado we were passed by a car full of kids. They rolled down their window and were laughing and shouting at us riding in the rain. We had the last laugh. They ran off the road while trying to make fun of our situation. Dub and I smiled and rode on. Later, we stopped at a rest stop to call Barb and let her know our ETA. While Dub was talking to Barb I decided to put on some dry socks. Sitting on the curb by my bike I thought the warm engine would feel good on my cold wet feet. I was right. I was lying on my back with my feet on the engine when Dub came looking for me. Because I was lying down he could not see me. He was walking around wondering where the heck I had gotten off to. We had another good laugh when he saw me laying on the ground. The engine heat did feel really good on my cold wet feet. I stayed several days visiting, site seeing and resting up before riding back to Dallas alone. I missed having my cousin riding along. For the most part the ride was uneventful. I had good weather, a bit cold and partly overcast the first day but not bad considering it was October. When riding that time of the year in Colorado the weather could have been really bad. I was lucky. I stopped at Capulin Volcano to take a break and play tourist. On the way up to the top of Capulin one of the supports broke on my windshield. I was in a bit of a panic until I figured out a fix. It held together the rest of the trip. I spent the night in Dumas again. I got an early start back to Dallas. Somewhere along the way I lost my Air Force fatigue shirt I had strapped to the luggage rack. I rode a ways back looking for it but had no luck finding it. I paid 4 years of my life for it and didn’t like losing it. Your fatigue shirt was like a “badge of honor” back in those days. 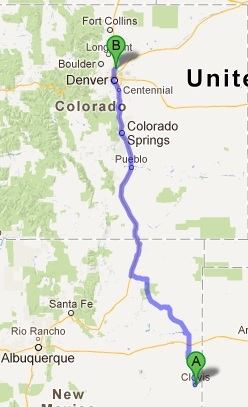 Until this ride, the longest ride I had been on was a 610 mile round trip. 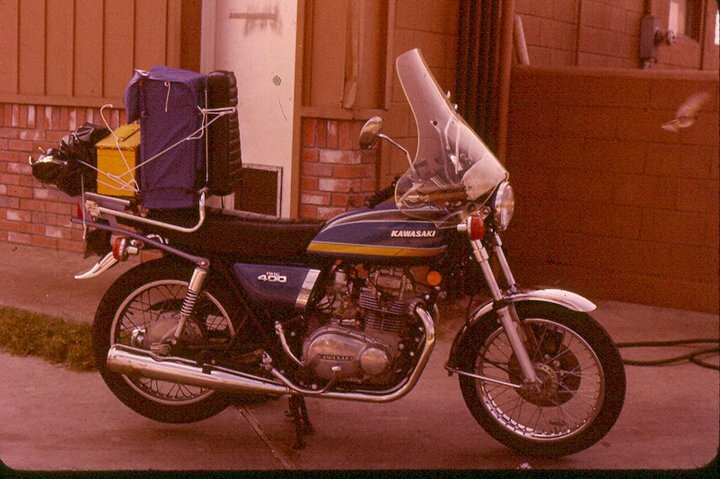 This ride of 1858 miles round trip ignited my love of motorcycle touring. It took me out of my comfort zone and I learned a lot from this trip. After this ride I knew I needed better gear and a bike better suited for long trips. I started a family shortly after that trip and I had to put my riding on hold for 23 years. Now I am trying to make up for lost time. My posts here will attest to that.